In this digital age, being connected online has become the norm. The internet allows unlimited access to whatever information that fascinates us. Getting online have become the most convenient way for us to entertain, work, learn new things, or socialize. It is major contributor to everyday living that our life has been so dependent on it. The internet is a must for everyone. What is the first thing you do when you wake up in the morning? Do you check your cellphone for messages and catch up on email before you even get out of bed? In today's increasingly-technological society, people are now engaging in digital behavior called "multi-screening". A typical multi screen user spends more or less 7 hours and 24 minutes on the screen daily. Of that time, 34% is spent on mobile phones; 33% on TV; 23% on laptops and 10% on tablets. Consumers balance their time between smartphones, tablets, PCs and televisions and this multi-screen use behavior is being readily being adopted everywhere. It has quickly become almost the default for most of us notwithstanding that these electronics are emitting a dangerous blue light that is negatively impacting our vision. We need eye protection since we spend so much time on gadgets. 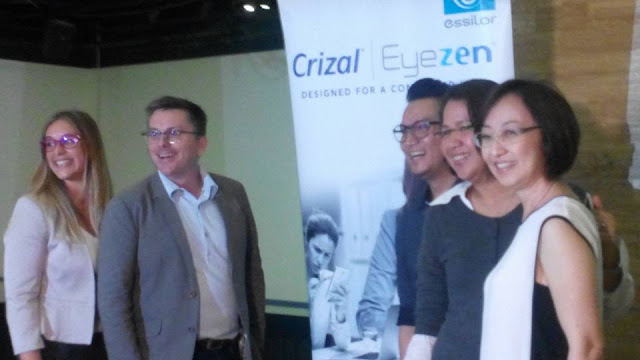 With this in mind, the global leader in ophthalmic lenses, Essilor introduces Crizal Eyezen™. Crizal Eyezen™ lenses are designed to replace ordinary prescription lenses or to assist occasionally the ones who usually do not need glasses, when viewing their digital devices. They exist in three (3) different optimizations according to the type of screen most used and the age of the patient. It features three revolutionary technologies—Eyezen Focus, Light Scan™ and W.A.V.E Technology that work in sync to relax the eyes from all digital stress and protect against harmful blue light. Light Scan™ Technology is a unique light filtering technology which protects eyes from the harmful blue-violet light emitted by digital screens. W.A.V.E Technology eliminates lens distortion for sharper, clearer vision at every distance and better vision even in low light. Crizal Eyezen™ is just one of the many technological innovations of Essilor. People’s visual needs will change as technology continues to advance and Essilor ensures that these needs are always complemented through its constant technological innovations, innovations that aim for people to see the world better. Get your Crizal Eyezen™ lenses in clear or Crizal Transitions at the leading optical shops nationwide. Don't settle for regular eyeglass lenses when you can have Crizal anti-reflective coated lenses. Crizal lenses are the best performing lens you can buy to do away with reflections that cause eyestrain and fatigue. Do visit www.facebook.com/crizaleyezenph for more information.